Nationwide, car accident deaths in the United States have gone up dramatically from 2015 to 2016. Although data is available from only the first half of the year, Reuters reports a 10.4 percent jump in car accident death. Most experts suggest bad weather and other conditions mean the second part of the year will be worse. This is on top of an increase in car accident deaths that happened between 2014 and 2015, as this year will be the second in a row when more people have died in auto accidents in the United States as compared with the year prior. This data is troubling safety experts, who have concerns about nationwide road safety. It is especially worrisome for those who live in Florida, though, because the increases in fatalities are not occurring uniformly throughout the United States. 24/7 Wall Street indicates Florida is one of the worst states in 2016 and has seen one of the biggest year-to-year increases in fatalities of any state in the U.S.. According to 24/7 Wall Street, there has been a 43 percent increase in car accident deaths in Florida over just two years. One proposed reason is that more motorists are on the road due to low gas prices and better economic conditions. There has been around a 3.3 percent nationwide increase in total miles driven, and more drivers on the road for longer always means more accidents. However, this does not tell the whole story, and a 3.3 percent increase in driving does not explain the 10.4 percent jump in fatal accidents nationwide, much less the 43 percent rise in car accident fatalities happening in Florida. Another possible explanation is distracted driving. 24/7 Wall Street suggests driver distraction is one of the leading causes of rising fatality rates in auto accidents. Each day in the U.S., an average of eight people are killed in crashes which reportedly involve a distracted driver. This is a huge number of people dying each year just because motorists are not able to pay attention on U.S. roads. Drivers need to be aware of all of the different kinds of distracting behaviors which can lead to this tragic outcome. This includes talking on the phone, of course, but it also includes other types of distractions as well. The use of in-vehicle infotainment systems is a distraction, as is using a GPS or any hands-free phone device while driving. 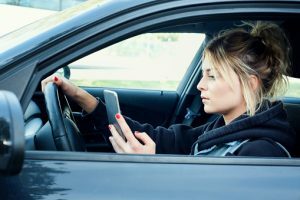 Eating in the car, having a pet in the vehicle, having too many passengers (especially for teens), focusing on the radio, and even daydreaming are all sources of distraction which could make auto accident risks greater for motorists. Drivers need to know of the added dangers that they face and should make certain they never allow anything to take their 100 percent focus off the road whenever they are driving. Florida cannot afford another two years of 43 percent increases in fatalities, so every motorist needs to do his part.